6 week old, s/p Repair of TAPVR. Upper panel - A-paced at 130 bpm. Lower panel - No pacing. 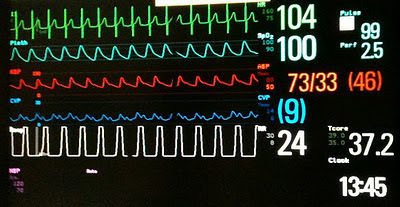 Diagnosis is clear from EKG trace itself. Notice the difference in waveform in CVP trace between the two panels. Name the waves in CVP trace. Which is the prominent wave in CVP in the lower panel (in junctional rhythm). Also, notice the change in BP between the two panels. (Time display at the right lower corner indicates that the two panels were recorded 1 minute apart from each other). Explain the 2 reasons for the lower BP while in junctional rhythm.